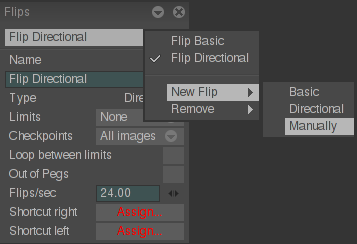 The Manual Flip is the last of one the configurable Flips proposed by TVPaint Animation. As its name suggests, this Flip will faire appel à votre main. Indeed, in a very intuitive way, you will be able to flip your animation either by moving your mouse, either by moving your stylus. Combined with a shortcut, you will only need to drag your mouse or your stylus from left to right or from bottom to top, but without clicking or touching your tablet with the stylus’ tip. Click on the menu on top of the panel to have once again access to New Flip. - You can stil change the Name and you can still see the flip Type. 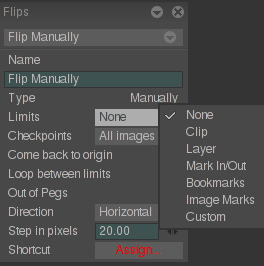 - Concerning Limits, the default option is None, like the Directional Flip. This Limit will let you flip your entire project, but we will explain it in lesson 8. 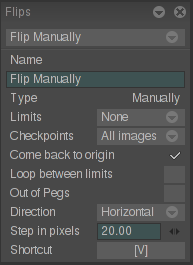 The other limits (Current clip, Current layer, Mark In/Out, Bookmarks et Marks) works the same way as the two other Flips. 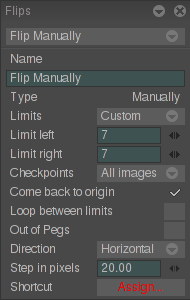 The Custom limit, where you can set the number of frames to be played before and after the current frame, works the same way as the Basic Flip. - Checkpoints are still the same : Images, Instances, Marks and Bookmarks. - The Come back to origin option is active by default. 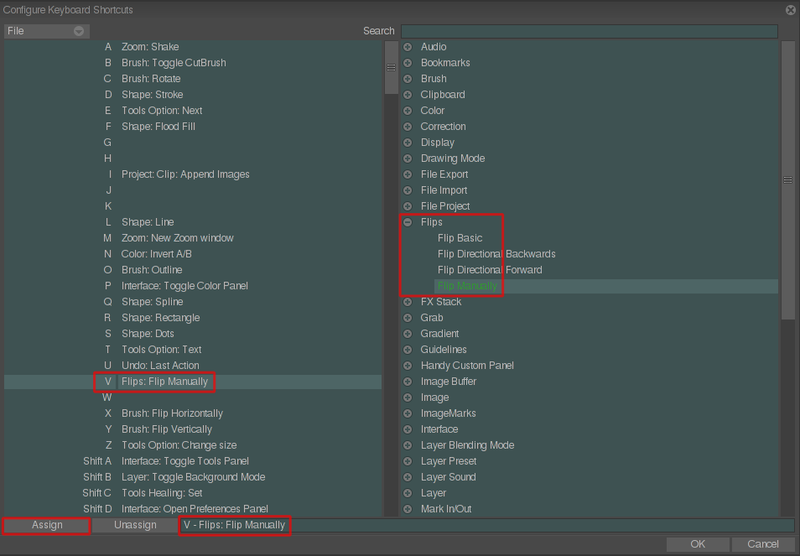 It lets you go back to the frame you were working on, like the two other Flips. 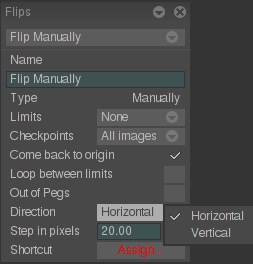 Uncheck this square, and the Flip will stop depending on the parameters you have set, which can let you progressively flip your animation with more freedom. - You can check the Loop between limits to see all of the animation. - The Out of Pegs option works the same way as the two other Flips. - You can give a Direction to the movement of your hand : Horizontal or Vertical. Depending on your habits, choose Horizontal if you’d prefer to flip from left to right (and vice-versa), or choose Vertical if you wish to flip upward or downward. - Here, there is no need for a Flips per second option, because you decide the speed by moving your hand, but there is a Step in pixels that sets a tolerance (in pixels) you can move from left to right or downwards. The higher the value, the less your movement will be sweeping. You can use the [V] shortcut, which is not assigned by default. 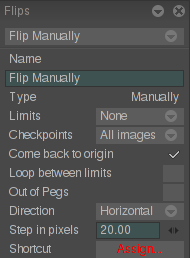 Your Flip is created. Hold [V] and move your cursor. Don’t you feel like having paper sheets in your hands ?